Home / More / Library / List of Medicinal Plants / Boerhavia spp. COMMON NAMES: Alena [Hawai’i]; huang xi xin (B. repens, B. diffusa), zhi li huang xi xin (B. erecta), zhou bo huang xi xin (B. crispa) [China]; a’atasi [American Samoa (B. repens)]; bashkhira [Pakistan (B. procutribens)]; erva tostão [Brazil (B. hirsuta)]; hog weed [Barbados (B. coccinea)]; patagon rouge [French West Indies (B. coccinea)]; puka k’ullu [Quechua (B. coccinea)]; punarnava [Nepal (B. diffusa)]; raiz de la china [Bolivia (B. coccinea)]; raktapunarnava [India (B. diffusa)]; ufi viole [Samoa (B. repens)]; urpa, tar vine [Australia (B. coccinea)]; wila k’ullu [Aymara (B. coccinea)]. 1) Moves blood and breaks up stasis. 2) Strengthens tendons and bones. 4) Clears out infantile malnutrition. OTHER ENERGETIC FUNCTIONS: Some sources state that punarnava (B. diffusa) is tonic (rasayana) for all organs and tissues, calming for all three doshas. Others claim it is rejuvenating for kapha. OTHER USES: Sticky leaves used as flypaper [Hopi (B. erecta)]. RANGE: Africa, Asia, Central America. B. coccinea is native to the Caribbean. B. diffusa is native to Hawai’i and Brazil. GATHERING: When gathering alena, the seeds stick to everything. Boerhavia has no abortive or teratogenic effects in rats [Singh 1991]. Reduces pain in mice [Hiruma-Lima 2000]. Antiamoebic in rats [Sohni 1995]. Alcohol and water extracts are liver protective in lab animals [Chandan 1991; Rawat 1997]. Ethanol extract of roots may be immunosupressive [Mehrotra 2002]. 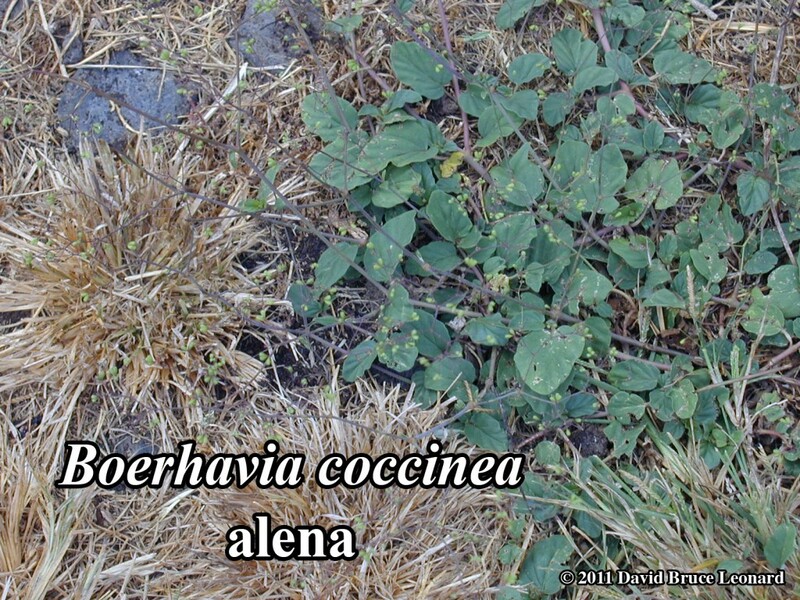 Because of the possibility of calcium oxalate crystals in Boerhavia spp., alena should always be cooked before any use. The seeds can be ground and added to baked goods. The roots of B. diffusa are baked, skinned, and eaten in Australia and Fiji. TOXICITY: The toxicity of Boerhavia spp. in mammals is inconclusive. One study reported the LD50 of root extract injected into mice to be 1 g/kg [Taylor 1988]. Other studies reported no toxicity in orally in mice at 2-5 g / kg [Chandan 1991; Hiruma-Lima 2000]. Yet another study reported renal tubular karyomegaly and myocardial degeneration in mice after injection with constituents from B. diffusa [Wrench 1999]. CAUTIONS AND CONTRAINDICATIONS: Numerous unreferenced sources report that the roots contain punarnavine, an alkaloid that reportedly increases urination and blood pressure, but this could not be confirmed through published papers. In India, the roots of Boerhavia diffusa are considered to increase longevity (“Rasayana”).